Dr. Gersten's clinical work is truly holistic (body, mind, and spirit) and relies on the information and power of the Health Map. While healing the body and developing OPTIMAL HEALTH and OPTIMAL ENERGY can usually be achieved (unless structural, tissue damage has already set in), empowering the mind and developing an OPTIMAL MIND is essential to total healing. Chronic illness is caused by a minimum of 7 Primary Causes. One of those Primary Causes is inevitably some form of stress, and it usually is responsible for causing 10 - 90 % of the illness (with 30% being average). Protein deficiency, on the other hand, causes about 25% of the total picture. I treat stress like I treat mercury toxicity. Each Primary Cause produces a certain percentage of the total illness. We need to remove the mercury. We also need to deal with stress. In one Mental Fitness Training (MFT) session, we can usually reduce your stress by 50%. Please read the brief bio About Dr. Gersten to understand that his work in strategic counseling and Mental Fitness is deep. He is a recognized pioneer both in Nutritional Medicine and in Mental Fitness Techniques, tools that help you access the mind-body connection to accelerate your healing. Illness starts with a number of primary causes. Let's say a person has malabsorption, mercury toxicity, and Epstein-Barr Virus as Primary Causes. In-and-of-themselves, they won't hurt you, but we need to identify and treat all Primary Causes. The action starts with Level II. The body responds to those Primary Causes with Inflammation and the Stress Response. It's very important that we specifically address the Level II responses. Eighty chronic illnesses are known to be caused by inflammation. That's Level II. Arthritis is mainly a Level I and II illness. Most chronic illness involves significant Level III problems with total body biochemistry, or “Metabolic Chaos.” Because the body, by dry weight, is 65% amino acids, amino acid therapy is essential in repairing Level III. When I interpret a patient's lab results, I do so in the light of the Health Map and I explain to my patients what all the Primary Causes are and how we'll address those. I explain our strategy for treating How the Body Responds to Primary Causes, and make a host of recommendations to repair nutritional and metabolic problems (amino acids, vitamins, minerals, essential fatty acids, and carbohydrates). The Health Map is the only cause-and-effect explanation of chronic illness that I am aware of. It helps make sense of the incredible complexity of chronic illness and also makes the process of making nutritional recommendations much more logical than it previously has been. Total body biochemistry is many levels deep. I've collapsed many layers of biochemistry into Level III. The black rectangles in the Health Map represent dominos. Illness is not a simple question of one cause and one effect. Illness is more like a cascade of collapsing dominos. 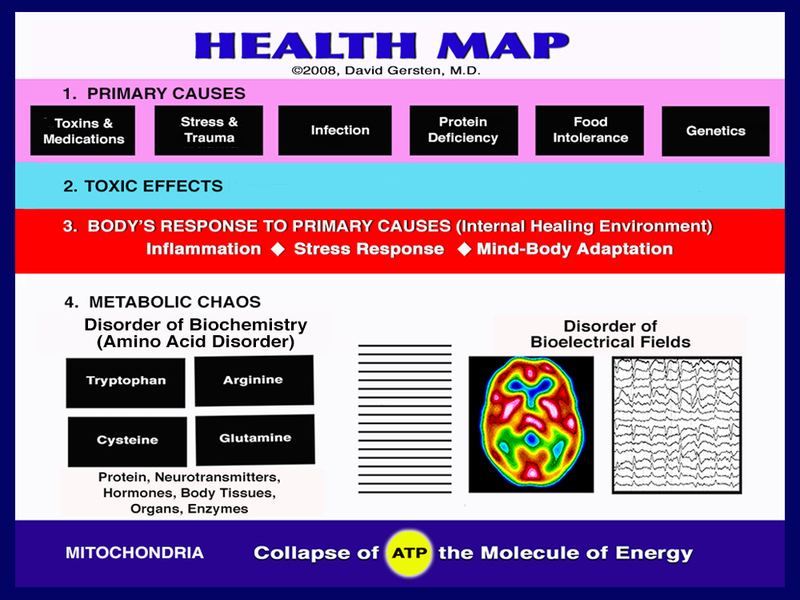 With Metabolic Chaos, all 70 trillion cells have major nutritional/metabolic problems. As the cascade progresses, there is a potential collapse of several “final common pathways.” Glutathione often becomes depleted. Glutathione has many functions: It is one of the most important co-factors for the production of ATP, the molecule of energy. It's also our body's main molecule that detoxifies. A second “final common pathway” is a shift toward the sympathetic (fight-or-flight) nervous system and away from the parasympathetic nervous system (PNS). The PNS is activated by things like rest, massage, a walk in nature, or a bubble bath. That's PNS. The shift toward fight-or-flight physiology impairs the production of ATP. There is at least one aspect of the Health Map not yet represented in the above graphic. Without ATP we die very quickly. What most people don't know is that every cell produces 10 billion free radicals (the bad guys) every day in the normal production of ATP. The number of free radicals produced daily in normal biochemistry is 10 billion times 70 trillion. Let's imagine that each free radical is a quarter-inch, the width of a domino. If we lined up all the free radicals produced in a day through normal biochemistry, they would stretch past the nearest star. That seems like an impossible problem to solve, but it was not impossible when we were in barefoot contact with the earth. The earth is covered with a layer of free electrons and when we are in barefoot contact with the earth, billions of free electrons per second enter our body. One thing those free electrons do is neutralize all those free radicals (as well as free radicals produced by inflammation. SEE YOUTUBE VIDEO AT BOTTOM OF THIS PAGE.